From left to right: Nick Pacelli, Thomas Gardiner, Dave Soto and Sean Quinn. 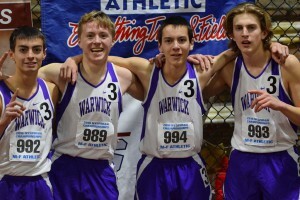 The Warwick boys 4 x 800 meter relay team has taken home its fifth New York State title in the past decade. Nick Pacelli, Thomas Gardiner, Dave Soto, and Sean Quinn ran an exciting race at Cornell’s Barton Hall in Ithaca on Saturday that saw the squad members gain position during each leg. Click here to read the Times Herald-Record’s coverage of the boys’ triumphant trip to the state championships.